Musically ambitious and bracingly eccentric, Duke Special – AKA the endlessly inventive Peter Wilson – is once heard, never forgotten. Duke Special’s sound is dynamic, with inimitable style and lush musicality; “this is music of magic and soul” (The Telegraph). Those who know Duke Special for the platinum album ‘Songs From The Deep Forest’, and the hit song ‘Freewheel’, may be surprised by the cultural breadth of his work. His immense creative talents have seen him involved in projects as diverse as writing the theme tune for the Irish Sesame Street to writing the music for and appearing in Deborah Warner’s critically acclaimed 2009 production of Bertolt Brecht’s ‘Mother Courage and Her Children’ at London’s National Theatre; and from performing with orchestras such as the Ulster and RTE Concert orchestras, to finishing an unfinished musical by Kurt Weill based on the novel Huckleberry Finn. Duke Special has also presented a documentary on the life and times of 1950s megastar Ruby Murray and been commissioned by the Metropolitan Museum of Art in New York to write a series of original songs based on photographs for their exhibition of the photographers Stieglitz, Steichen, and Strand. Duke Special’s 4th studio album ‘Look Out Machines!’ was released in April 2015 on Stranger Records. The Ulster born singer songwriter and gramophone impresario, has superbly crafted this new collection of catchy, rousing and lyrically poignant tracks. ‘Look Out Machines!’ sees Duke exploring new musical ground with collaborators including Iain Archer, Phil Wilkinson and Gary Clark and heralds the return of an artist back at the very top of his game; an epic album from a unique artist. It’s a grand gesture of a record that displays a rare and timeless quality and speaks with a refined eloquence. “The Duke’s cowboy-gone-vaudeville dreampop is pitched between Rufus Wainright and the Divine Comedy” - Uncut. Duke Special appears at The Apex on Thursday 15 October at 8pm. 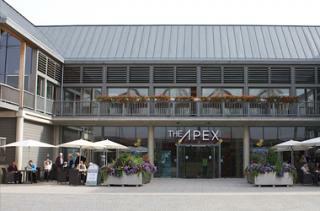 Tickets are £15, call the Box Office on 01284 758000, or visit www.theapex.co.uk for more information, or to book.